2013 coverings: click here and read all about our special veterinary package! 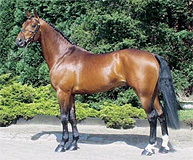 Triomphe de Muze is a son of the great Chin Chin who competed at two Olympic games, Barcelona and Seoul, where he finished sixth individually and also winner of five consecutive North America league world cup qualifiers in show jumping. On his dam side, Triomphe has the world renowned Galoubet, sire of an Olympic champion Baloubet (Athens) and Grand Sire of world champion (Herez) Liscalgot. 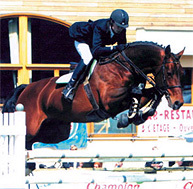 Triomphes dam Caprice won the semi-final for the 6 year-olds in the Belgian Championships in Gesves in 1996. He isa great jumping talent out of a proven performance line. 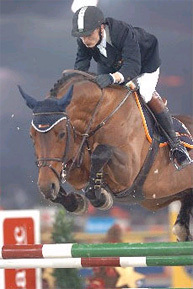 He has the highest index of a stallion stationed in Belgium (Jan 2005) with 188 points and jumps very successfully internationally. 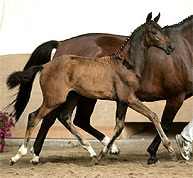 Triomphe de Muze produces tailor-made, alert horses that show a lot of shoulder freedom, suppleness and elevation in the movements. 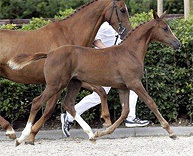 His son Triomphe W is approved by the KWPN and has produced several foals that have been sold for very good prices at the foal auctions. 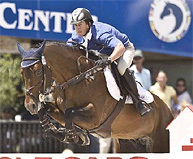 WELLINGTON, Fla., April 25–Jonathan McCrea’s first time riding Triomphe de Muze was only 24 hours before winning the $10,000 Wellington Golf Cars Welcome Stake at the Palm Beach International Equestrian Center Friday. McCrea got the ride when his wife, Christine, took the reins of another of the horses owned by Candy Tribble and Windsor Show Stables a week earlier that Jonathan had been competing. “It’s turned out great,” said McCrea of Suffield, Conn. after going double clear on the 11-year-old Belgian Warmblood as the lat of the 25 combinations that started the final in the series at the Spring 6 show. Twelve advanced to the jumpoff. McCrea and Triomphe de Muze, who was bought in Europe about nine months ago, posted a time of 37.841 secs., with Ramiro Quintano and Sydney second in 39.336 and Pablo Gamboa and Ultimo third in a time of 40.083 secs. Ken Berkley of Flemington, N.J. and Carlotta finished fourth, but the $1,000 in prize money they won was enough to take home the golf cart presented by Wellington Golf Cars for the combination winning the most money in the Welcome Stake series. Laura Kraut of Wellington and Le Prestige St. Lois led the standings up to the last event, but she was in Europe and did not contest the final two classes.